Mudwig's style and attitude to his work have gained him a very separated reputation. Priding himself on a nonconformist secratarian approach, his distinctive art exists in a realm of its own, spanning media ranging from painting, animation, billboard subversion, sculpture, and performance. Inspiration is drawn heavily from the 20th century historic propergander iconography; fusing these elements with fragmented 'Seussian' inspired comic forms; the artist constructs an alternate reality reactive to his unique, off-centred vision of the world around him. 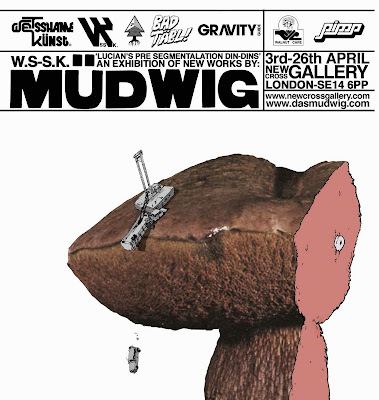 A show that must be seen to get an insight into Mudwig's visual state. This is great stuff! If you're going to this show I am very jealous. His stuff reminds me of a t-shirt I have, although I don't know who made it.